First-off, we have an apology to make. 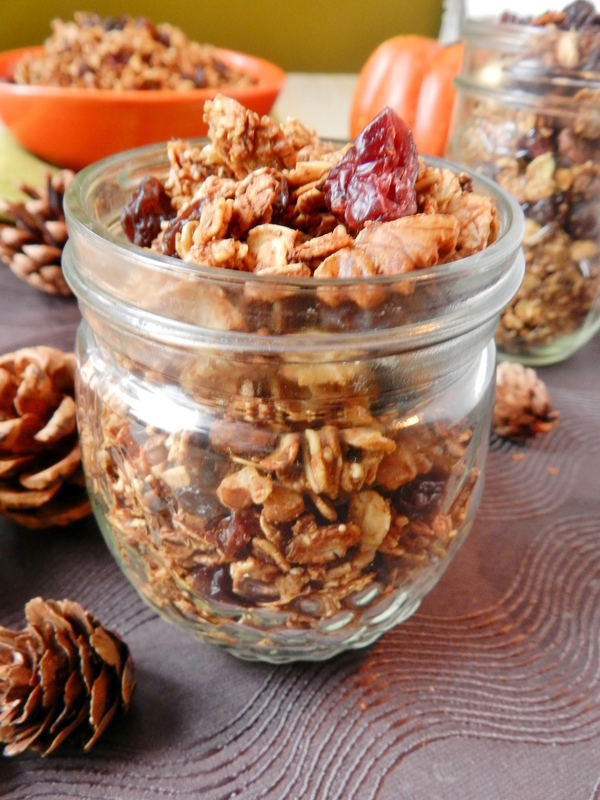 Last What I Ate Wednesday, we promised we were going to post our pumpkin granola recipe, and here we are one week later, half our granola is gone, but there has been no recipe for you all! We’re very sorry. But never fear, today we are finally coming through on our promise! But first, it’s What I Ate Wednesday Time! 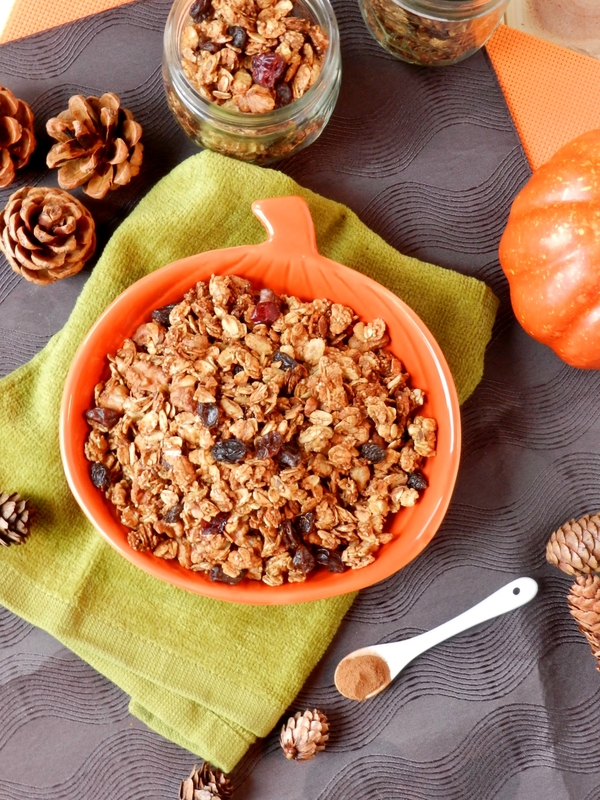 So we’re not trying to make excuses here, but the reason we’ve been so MIA lately, is because we have a large and rather scary midterm coming up at the end of the week, which is why we have not been posting quite so frequently, and also why we have failed to share with you our pumpkin pie granola! 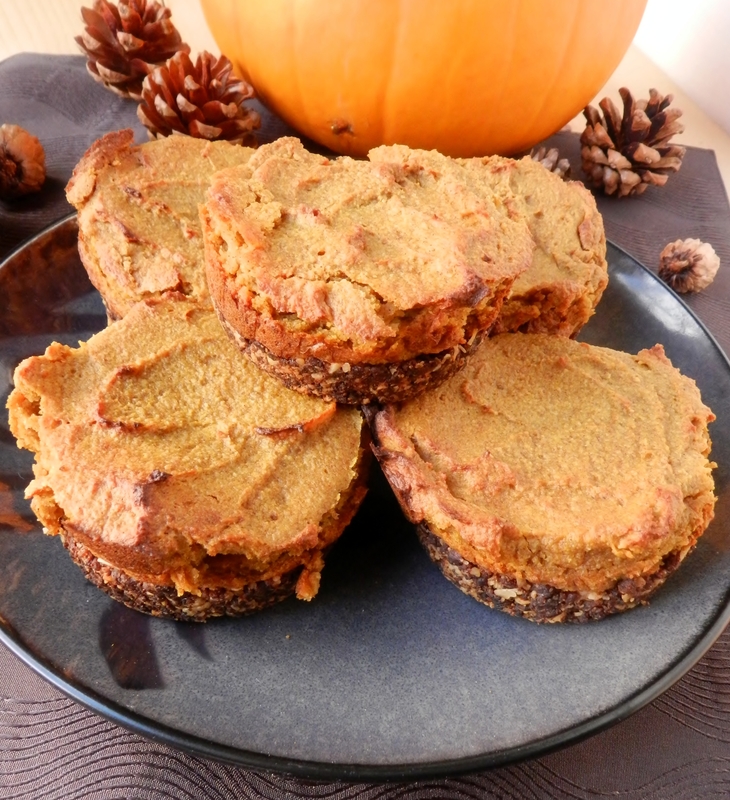 Thankfully, other bloggers have come through for us and taken beautiful photos and written fantastic posts about their recipes, and so today we will be sharing with you some of the delicious eats we’ve been having, courtesy of those lovely individuals in our never-ending attempt to get through the recipes on our Pinterest board! Wow. This was one of the tastiest recipes we made all week. 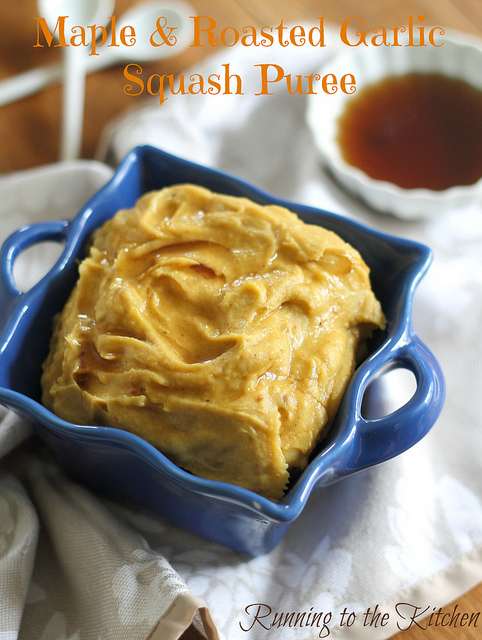 A major shout-out to Gina for sharing this, if it’s possible we think after eating this we’re even more in love with squash than we were before! 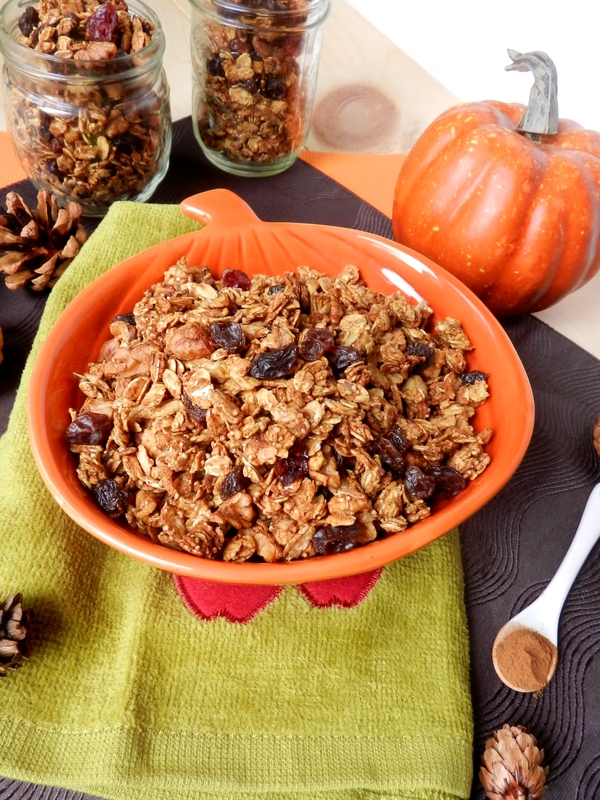 And in between all of that, we’ve been plowing our way through two giant jars of pumpkin pie granola! 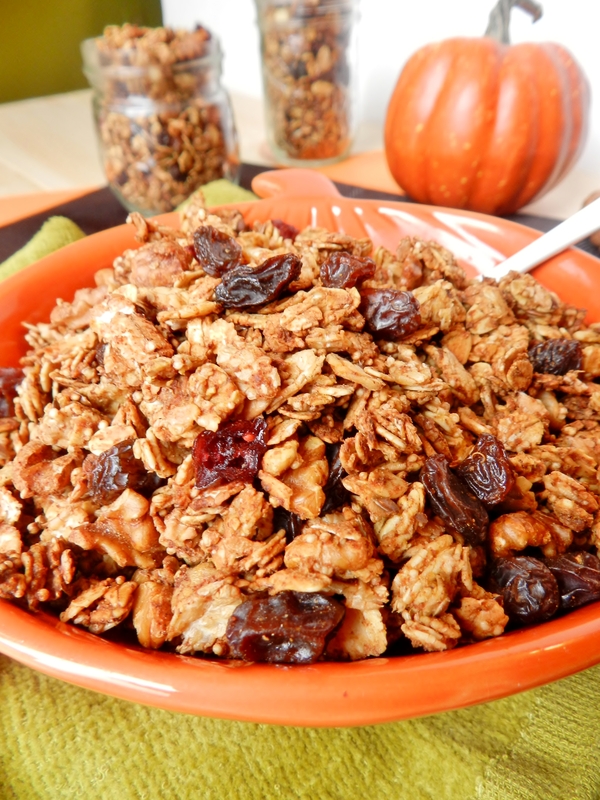 Like we said last wednesday, as soon as our Love Crunch was gone we knew we had to make more granola asap! 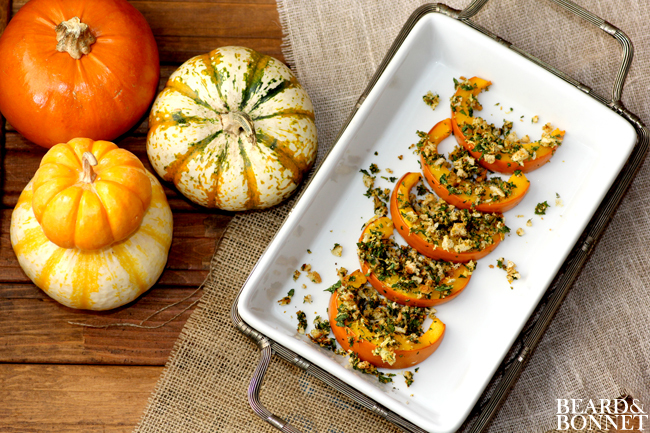 We thought about making carrot cake, but then decided that ’tis the season for pumpkin so why not make pumpkin pie granola? Let us tell you, guys, this stuff is good. It’s crunch, not too sweet with a little bit of spice. We used a variety of different flakes (kamut, oat and spelt), but if you don’t have all of those and can’t wait don’t have time to go to your nearest bulk store to get some, using all oats would work well too. There really isn’t much else we can say about this granola, except that if you like granola and you like pumpkin pie, you will love this granola and you should probably go make this. Don’t forget to head over to Jenn’s blog and check out the rest of the WIAW posts! 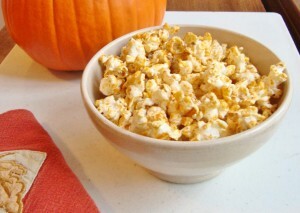 Combine dry ingredients and wet ingredients separately, then mix together well. 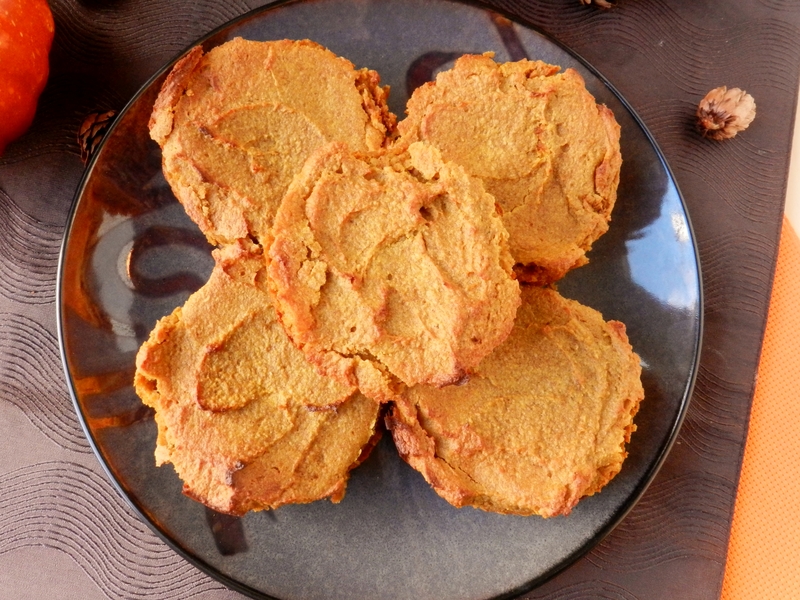 Spread out on a baking sheet and bake for 20-30min, stirring occasionally, until lightly browned and crispy. 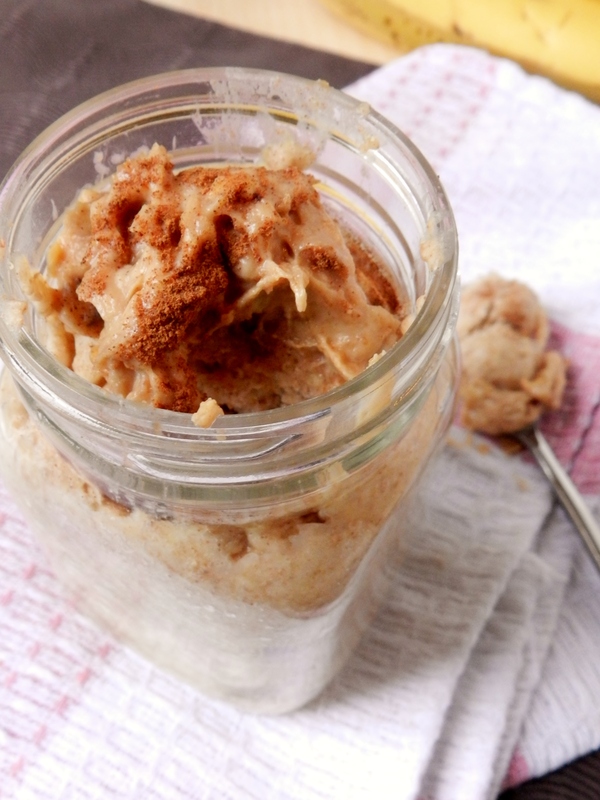 Allow to cool and store in jars or plastic containers. We will be recapping our Provincial Championships soon, and will be showing you what our team dressed up as for halloween, what will you (or your kids) be wearing this year? Posted in Uncategorized and tagged breakfast, dairy free, easy, egg-free, granola, healthy, kamut, oat, snack, spelt, vegan, what I ate wednesday, yummy. Bookmark the permalink. Today, we are reviewing another product! Disclaimer: Tropical Traditions provided us with this product to review, and we were under no obligation to review it if we so chose. Nor were we under any obligation to write a positive review or sponsor a product giveaway in return for the free product. Tropical Traditions is a great company with tonnes of products – from food to skin care, household and pet products! Their coconut oil is their main product, however they sell other oils, as well, and if you visit their website, not only can you find more information about their other products, but you can also find lots of awesome recipes. 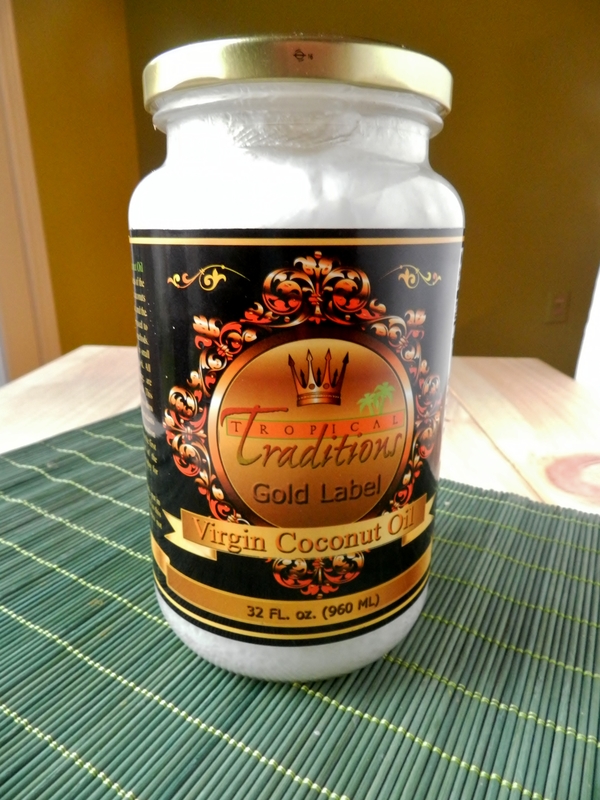 Back to our review – we REALLY liked this coconut oil! It is soft and creamy, making it very easy to use in a wide variety of dishes, as well as in baking. It has a much more subtle coconut smell than coconut oils we’ve used before, almost with a light toasted smell to it. It has a little bit of texture to it, yet it still remains very smooth and blends into things quite well. When it starts to melt, it lets off that beautiful coconut aroma that we’ve come to love about cooking with coconut oil. 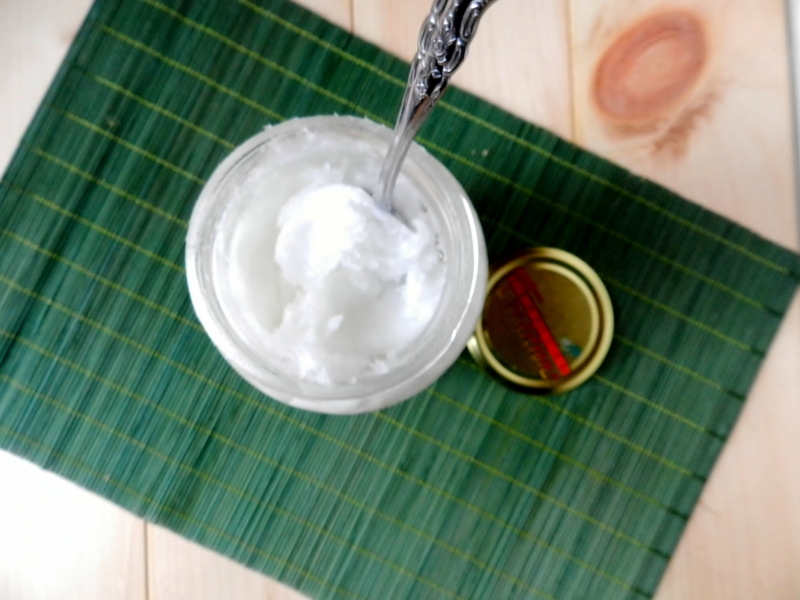 You can click here to watch a neat little video about cool ways to use coconut oil! For these fries, all we did was toss them in a little bit of the coconut oil (just enough for a light coating) and some salt and pepper, and them baked them at 400 degrees for 20min, then flipped them over for the last 5min. We would have flipped them over sooner, but we didn’t expect them to be done that soon! We had our oven on the convection setting, so they cooked a lot faster! So – on to the giveaway! – Tweet about our giveaway! The contest will close on Sunday, November 4 at 10:00pm (Eastern Time Zone). 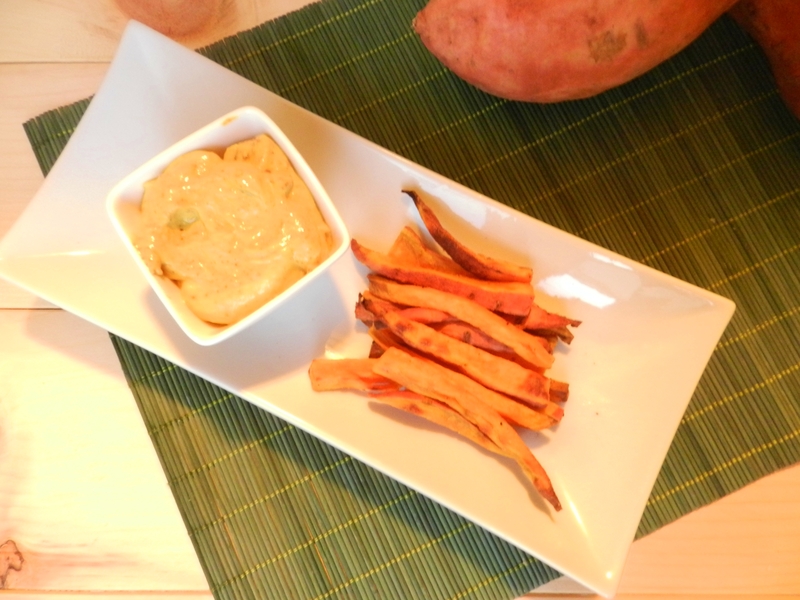 Posted in Uncategorized and tagged chili cheese sauce, coconut oil, giveaway, healthy, sweet potato fries, Tropical Tradtions. Bookmark the permalink. But we were mean and we have been withholding it from you… until now! 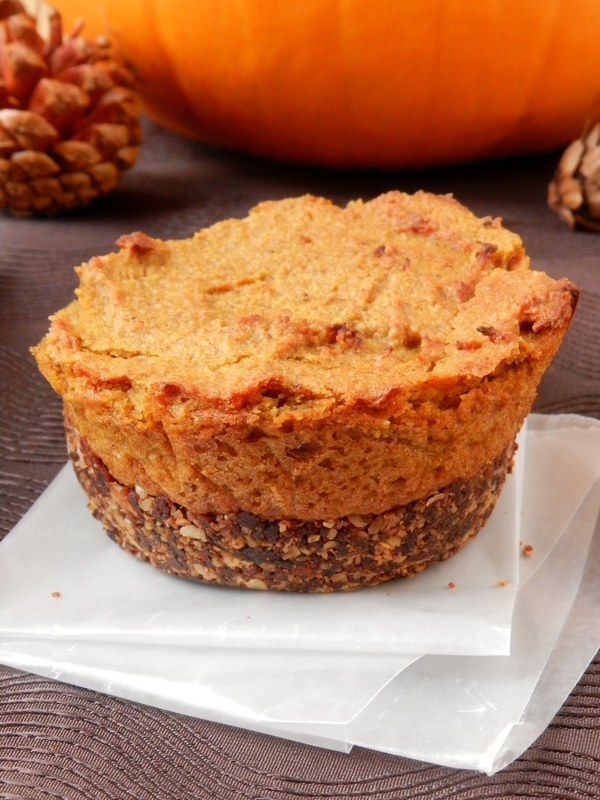 Vegan Pumpkin Pie Cheesecake. 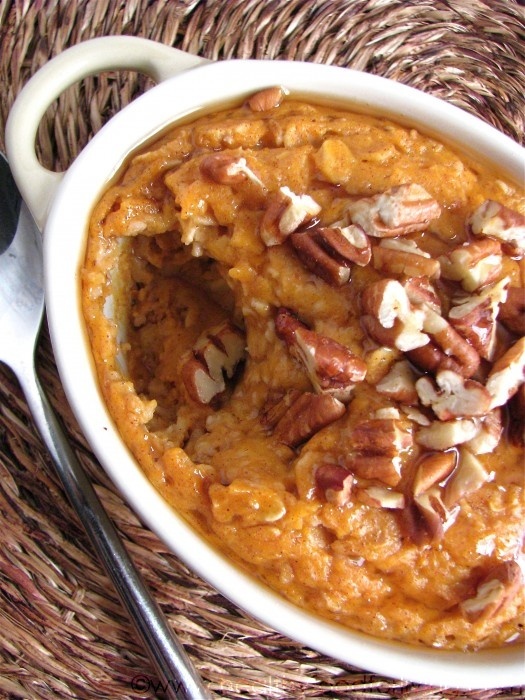 We could end this post with just that and give you the recipe now, because really, what else needs to be said? 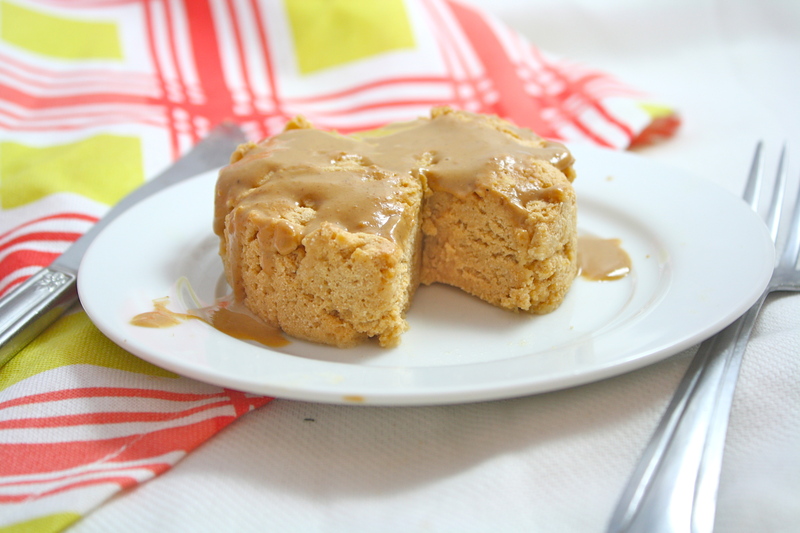 So you’re probably wondering- why make vegan cheesecake if you’re not vegan? Because we can. 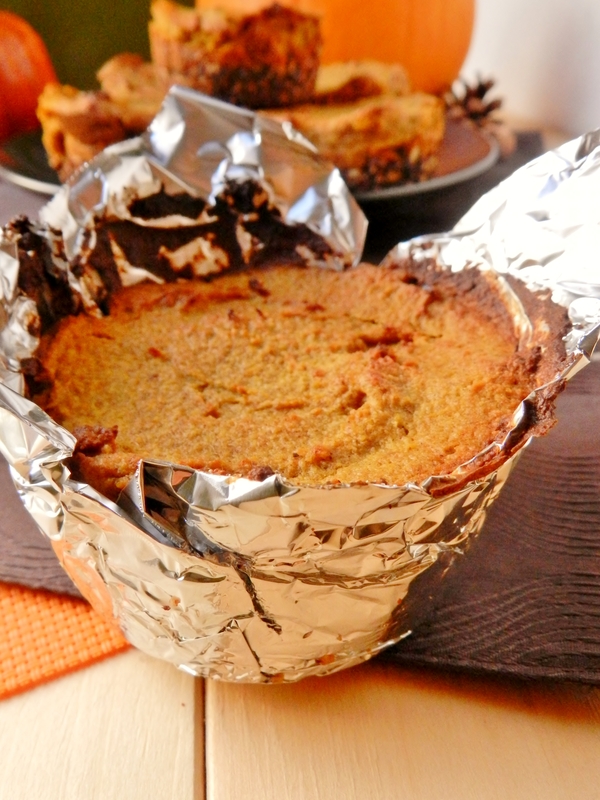 It’s a bit more of a challenge, and we like a challenge 🙂 If you remember, we made a zucchini-bread cheesecake a while back, and it turned out fabulously! We knew at that moment that we couldn’t let that be our last experiment with vegan cheesecake! Well we’re not trying to brag, but we think that this second version turned out just as well (if not better!) than the first! 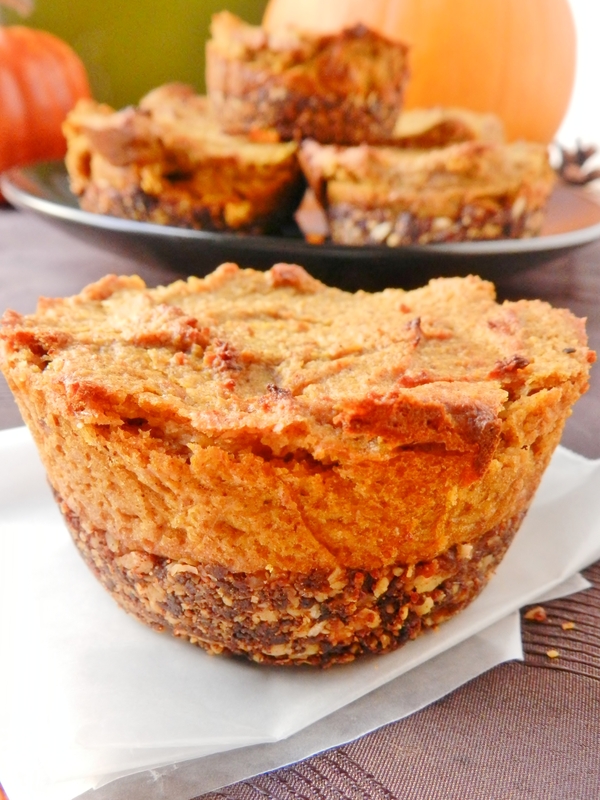 Thick, creamy pumpkin over top of a chewy, oat-and-nut crust. People, food heaven lives here! Our initial intent was to make 1 large cheesecake, but then we thought, what’s better than having a slice of cheesecake? How about your own personal-sized cake, where you can eat the whole thing all by yourself? The choice was obvious. So whether you’re vegan or not, make this cheesecake- you won’t be disappointed! 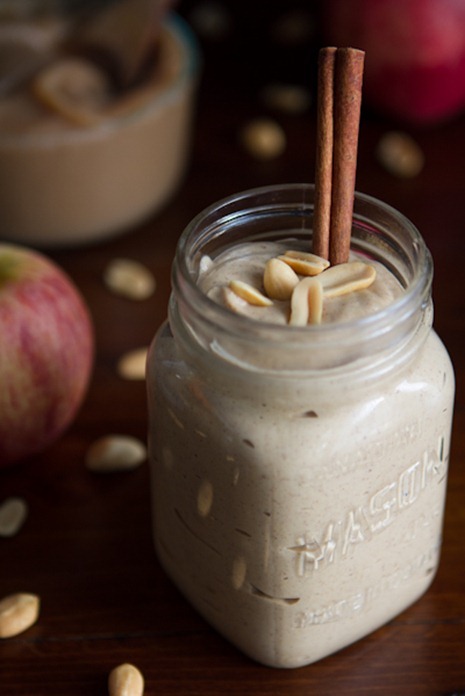 For the Crust: combine all ingredients in a food processor or high-power blender and pulse until everything is all ground up, and mixture sticks together when pinched. 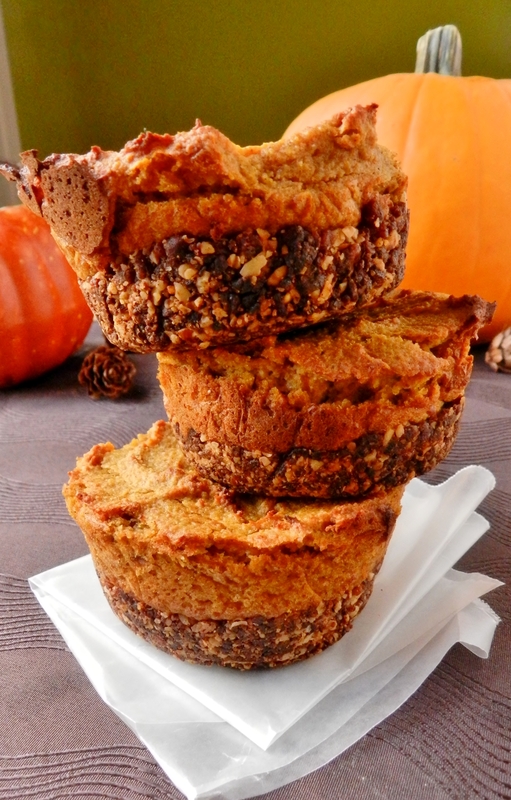 Divide mixture evenly between 6 large lined muffin tins and press firmly into the bottom. For the Cheesecake: blend all ingredients in a food processor or high-power blender until smooth. 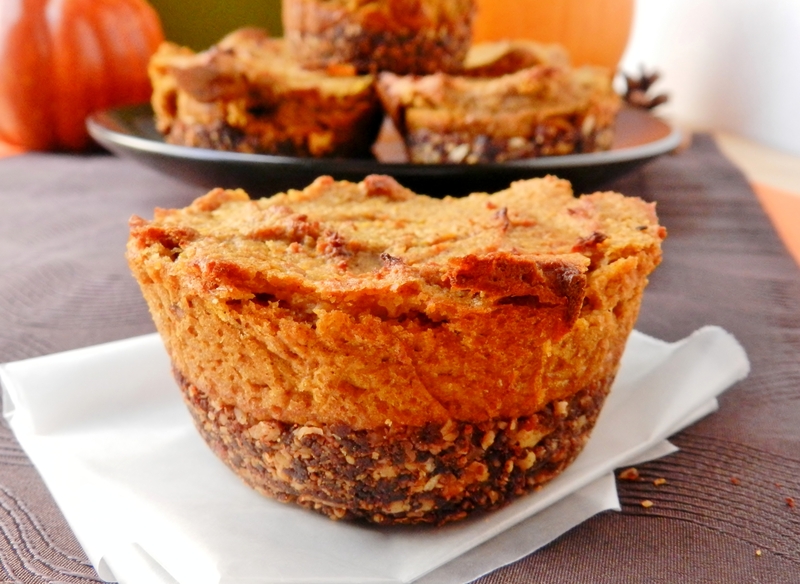 Divide amoung the muffin tins and smooth with the back of a spoon. Bake for 30 minutes, or until cheesecakes are firm to the touch. What is your favourite cheesecake flavour? 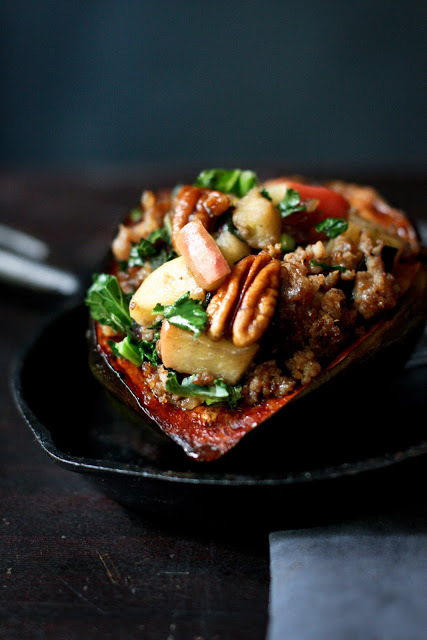 Do you ever experiment with creating dishes for specific diets, even if you’re not on that diet yourself? 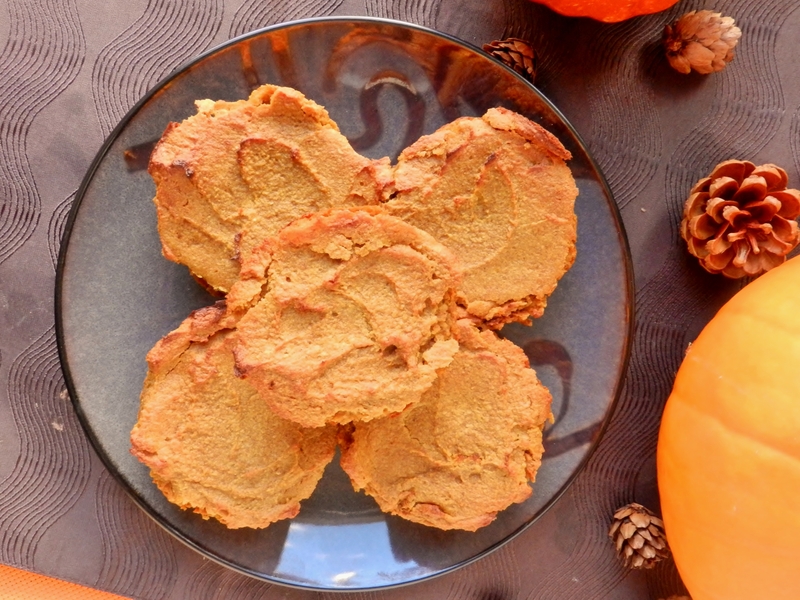 Posted in Uncategorized and tagged cashews, cheesecake, dessert, easy, fall, healthy, pumpkin, pumpkin pie, sugar-free, vegan, vegetarian. Bookmark the permalink. We are so happy it’s What I Ate Wednesday today, because we have been having some good eats lately! We have been making a lot of items off of our pinterest board (though our pinning rate is still faster than our making one!). Creamy, sweet and spicy (in a cinnamon-y kind of way) and with no added sugar, these adorable little cheesecakes are indulgent in a non-indulgent sort of way. Need we say more? The recipe will be up Friday! 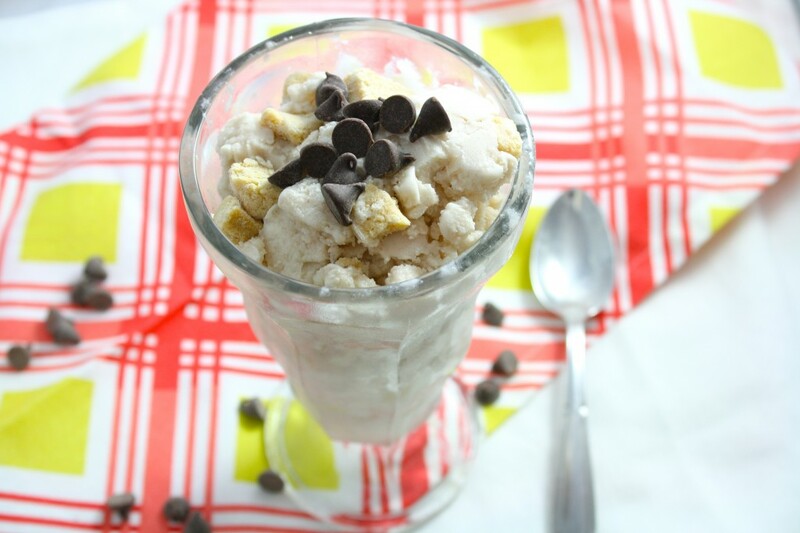 Since we burned through our Love Crunch granola in one week, we knew we had to make something to fill the void! 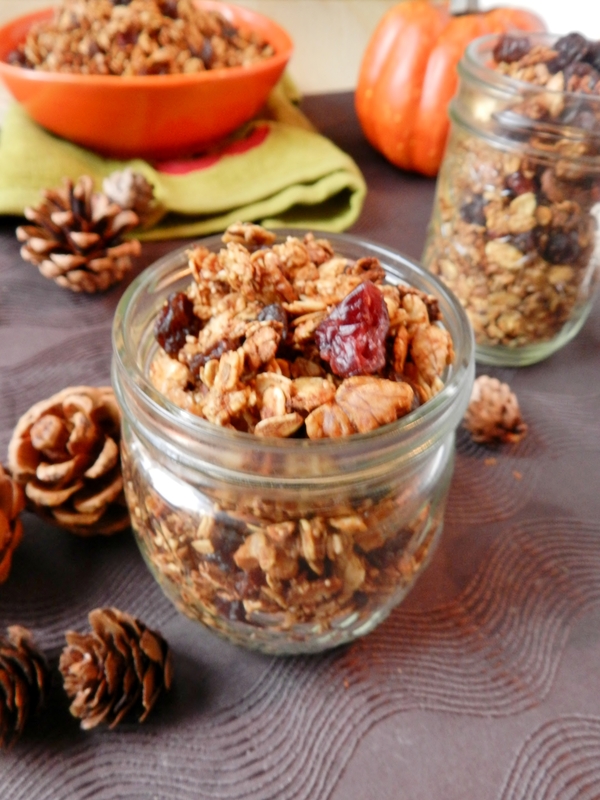 We’ve been meaning to make pumpkin granola the entire fall season thus far, and now we finally got around to making it. 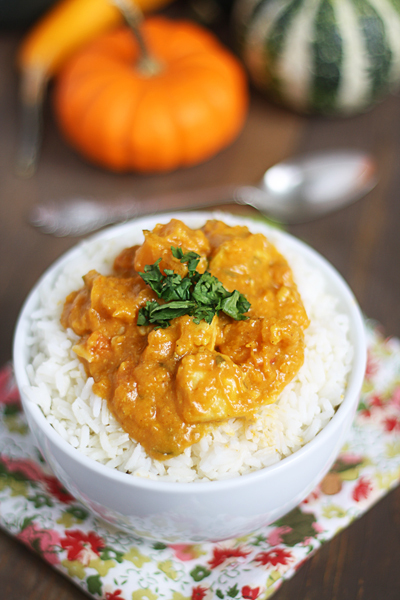 This recipe will be up on the weekend! Don’t forget to head on over to Jen and check all the other WIAW posts! 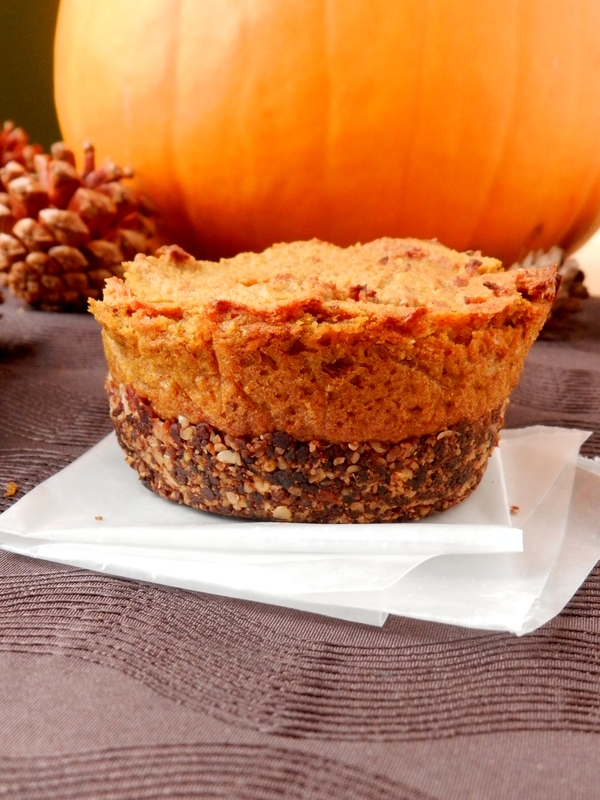 Posted in Uncategorized and tagged cheesecake, granola, healthy, pumpkin, vegan, vegetarian, what I ate wednesday. Bookmark the permalink. It’s back, and we can’t believe it’s already been a week since last week’s meatless Monday, jalepenos! 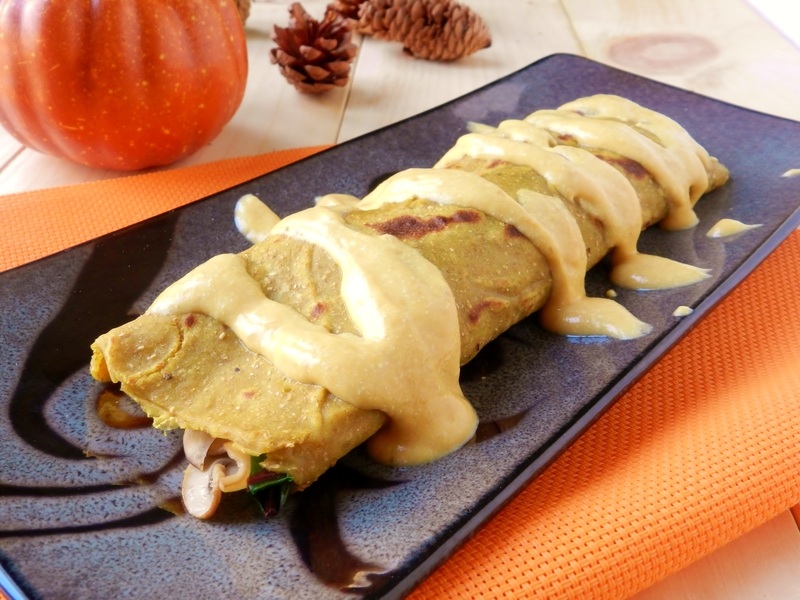 Sweet n’ Sour Tofu Crsipy Kale Role-Ups. Try saying that 10X fast! 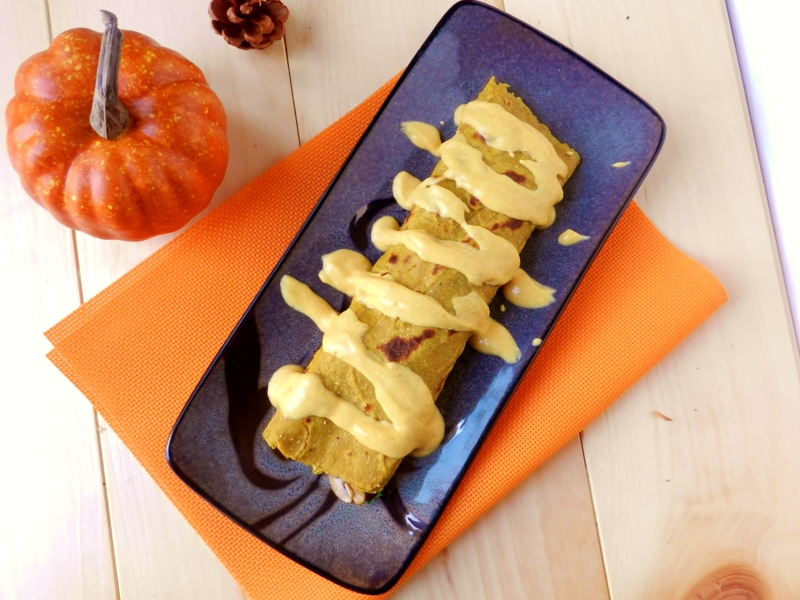 These fabulous little wraps are quick, easy, and oh-so-delicious! 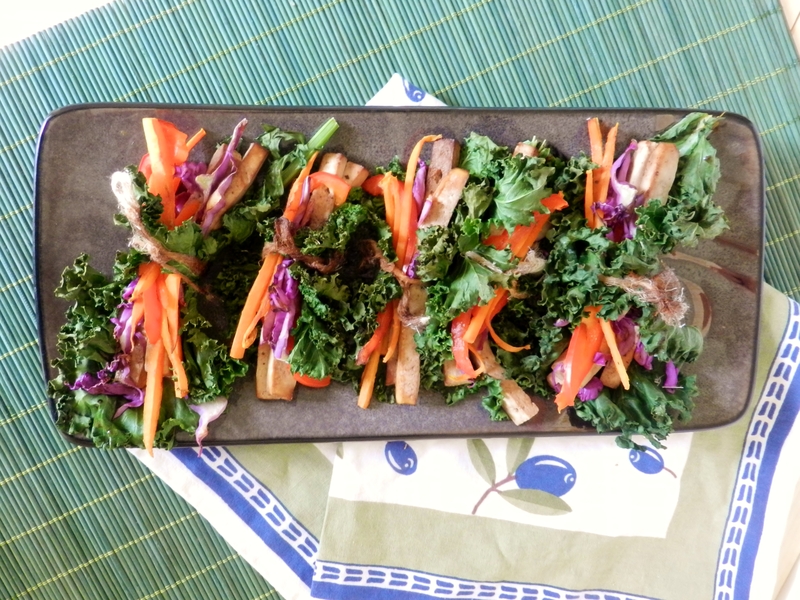 The kale and tofu gets all crispy, and the veggies soften slightly (tender crisp, you could say). Tonnes of sweet-and-sour flavour packed up with crispy colourful veggies – does it get any better? The sweet and sour marinade is made of low sodium soy sauce, peach juice, and ginger. 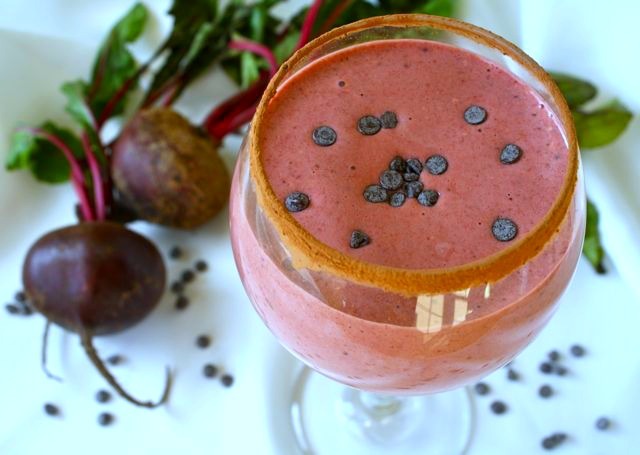 You can use any fruit juice, really, you just may have to adjust for the sweetness level based on the sweetness of your fruit juice. 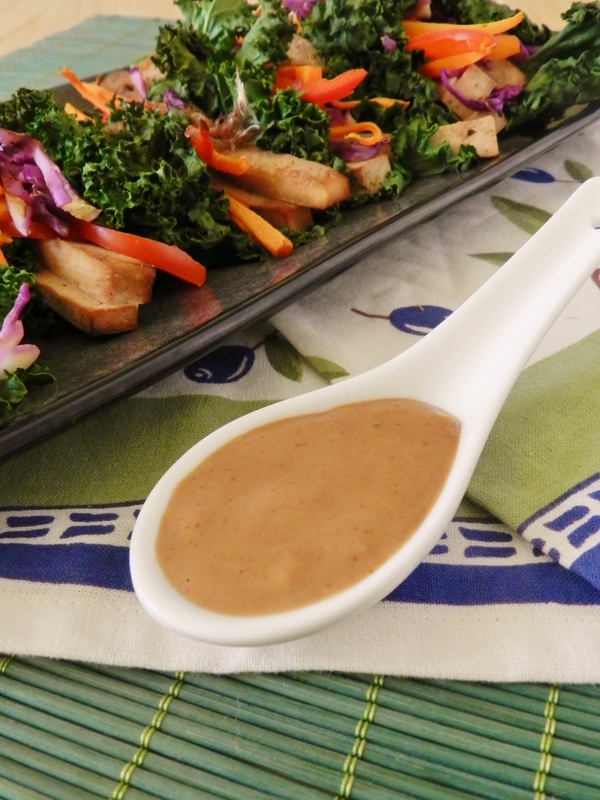 Served with a peanut sauce, because what’s sweet and sour tofu and veggies without a peanut sauce? 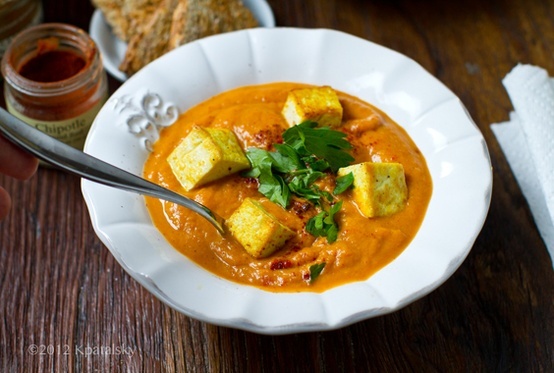 Press the tofu to squeeze out extra water for at least 15 min. Slice it into 1cm-wide strips. 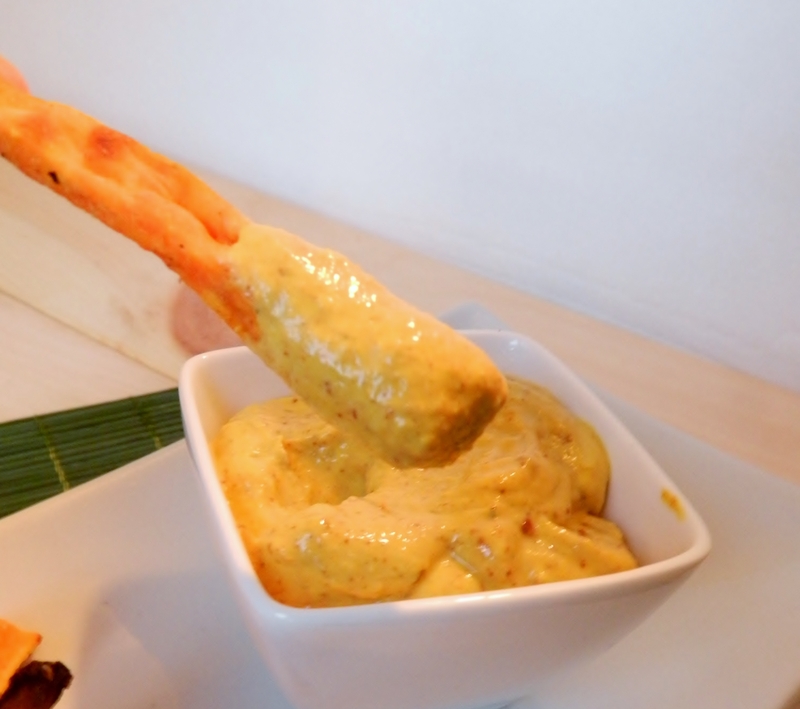 Combine all marinade ingredients in a plastic bag or container and allow to sit for at least 30min. 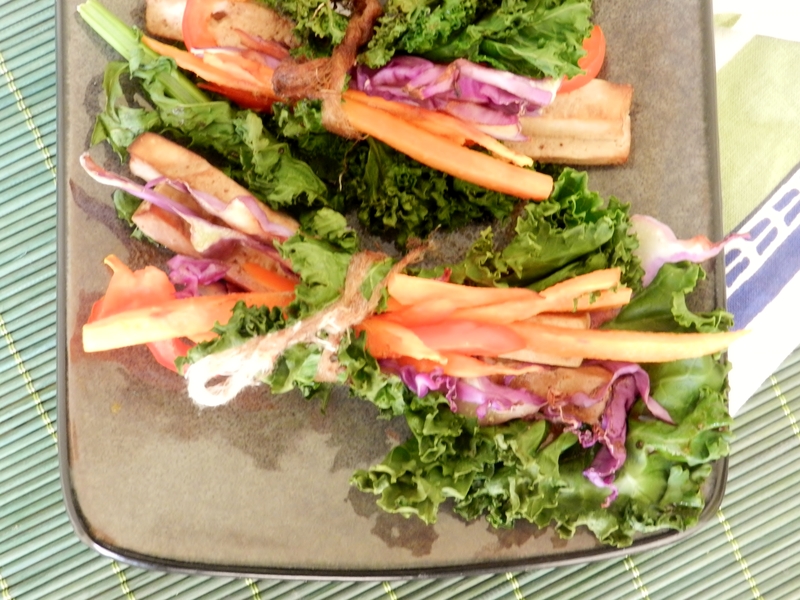 In the center of each kale leaf, place 2-3 tofu strips and top with the julienned veggies. Using string or strips of cheesecloth (what we had on hand! ), tie the roll-up so it will stay together. Place on a baking sheet and drizzle with left-over marinade. 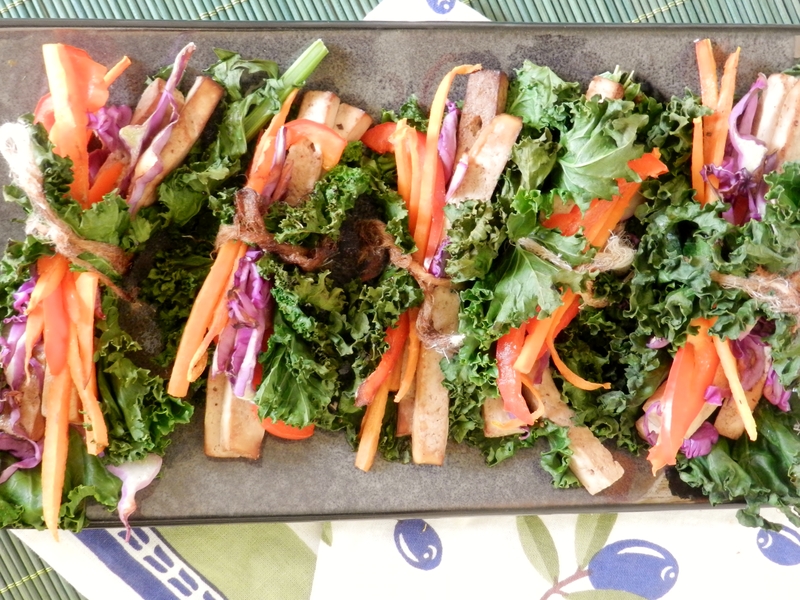 Bake for 5-10min, until kale and tofu are crispy and veggies are tender-crisp. 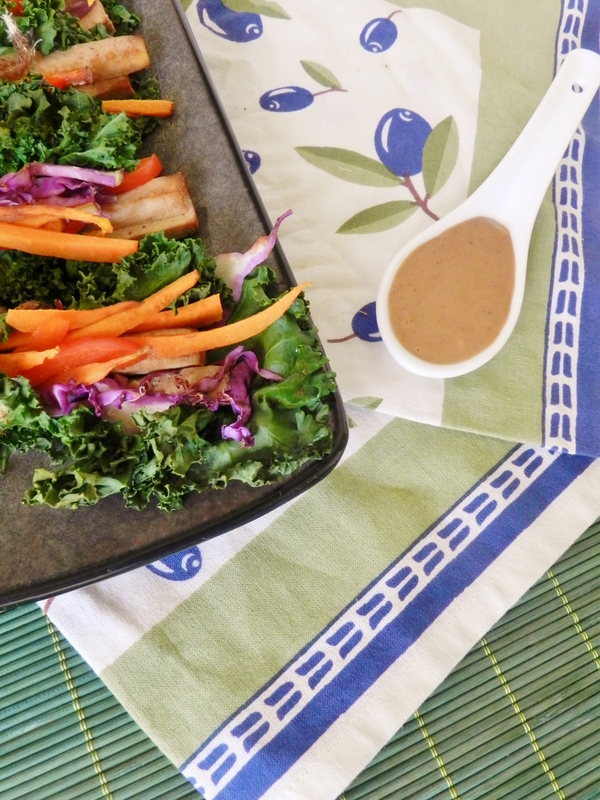 Combine peanut butter, soy sauce and ginger in a bowl. Add water, a half-tablespoon at a time until you have reached desired consistency. 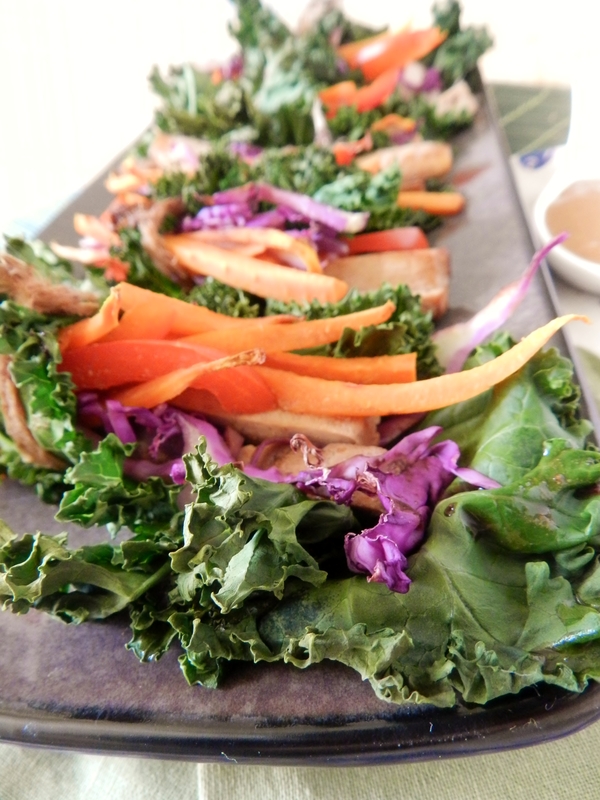 Have you ever made kale-wraps before? 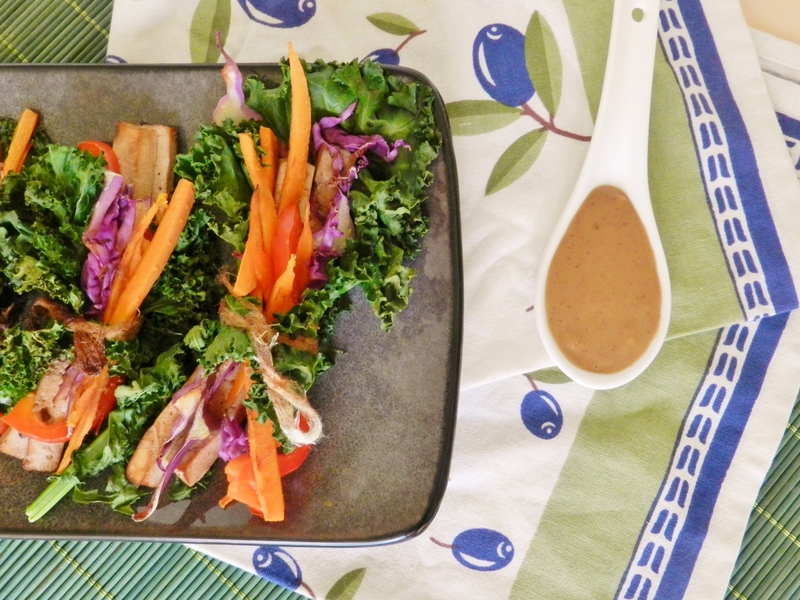 Posted in Uncategorized and tagged dinner, easy, healthy, kale, low fat, low sodium, lunch, Meatless Monday, peanut sauce, sweet and sour, tofu, vegan, vegetarian. Bookmark the permalink. You know how in any workout regiment, you always have those workouts that you dread? Ones that are so long, so tough, or so difficult that just thinking about them makes your lungs burn and your body tired? We had one of those workouts yesterday. Our workout consisted of a 5km warmup (we actually run out of London), five 1km repeats at our max, strides afterwards, and then a 5km cool down. So basically, we’re completely dead after. Shaky legs? Yes. Naturally, we need to make sure we refuel well after a workout such as this, and one of the girls had the genius idea of going to The Works after practise. 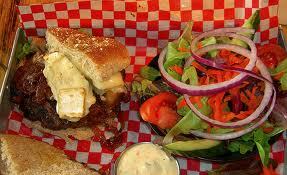 Gourmet burgers? We are sold! Pretty much our team’s favourite restaurant. It’s an awesome place! You have your choice between ground beef, turkey or elk, as well as a whole chicken breast, veggie burger, or portabella mushroom cap. All 100% Canadian and gluten free. Of course, we both got elk! Often when we say that, people cringe, however Elk, as well as other “wild beef” is extremely nutritious, and so so good! Elk is leaner than beef, and is higher in protein, iron, the B-vitamins, and also contains a host of other vitamins and minerals. To read more about the benefits of elk, go here. 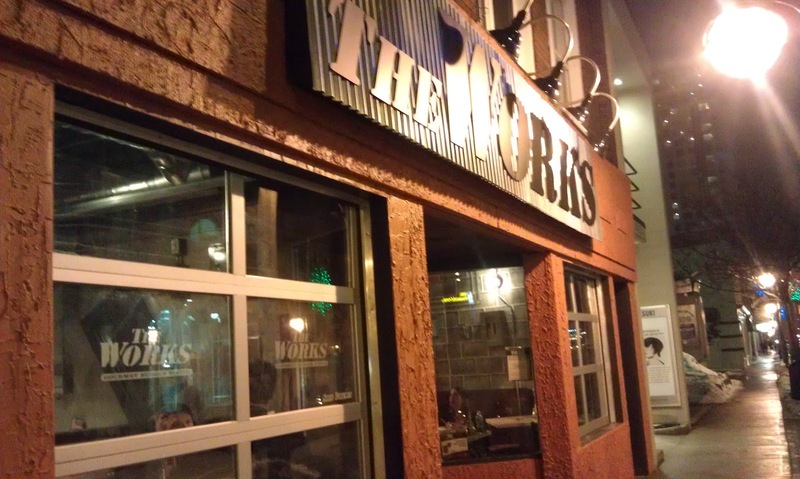 The second step at the works is to choose your actual burger. They have over 70 combinations, broken up into 7 categories – Top 10 Burgerhead Faves, Born to be Wild, Gettin’ Saucy, ‘Cuz We Like it Hot, Carnivore’s Corner, Veg Out and World Tour. 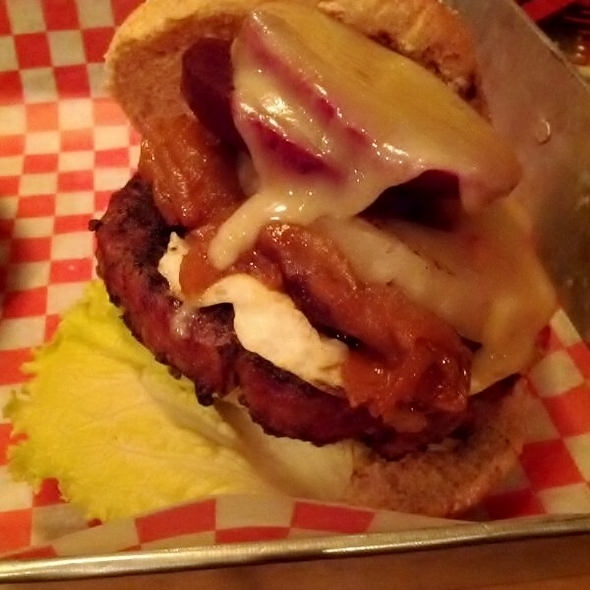 The last time we went, both of us got the Sweet Ride from the Born to be Wild section – caramelized onions, grilled pear and brie cheese – oh.my.word. It was unreal! This time, we both got the Down Under from the world tour (unintentionally ordered the same thing, we swear!) – caramelized onion, egg, beets, grilled pineapple and gouda cheese, except we both had it sans-egg. It was so good! We don’t know which one we liked better, they were both equally amazing! The Down Under – aweful picture, we know! Once you’ve chosen your patty and burger, you have to choose your bun and side. For buns, they have the option of white, whole wheat, and gluten free. We both got the whole wheat, which was excellent, and according to the girls who can’t eat gluten on our team, the gf bun was great as well! They have lots of options for sides, such as salads, steamed broccoli, sweet potato fries and regular fries, mashed potatoes, etc. There were no complaints about any of the sides from anyone at our table, that’s for sure! Many of the girls got milkshakes, as well, which are served in measuring cups! (Wanted to take one home, refrained.). Posted in Uncategorized and tagged burgers, cross country, down under, elk, London ON, restaurant review, running, sweet ride, The Works Burgers, VO2 max, work out. Bookmark the permalink. Here at Two Saucy Sisters, we love crepes! Remember our Carrot Cake Cheesecake crepes? Or how about our Chocolate Banana Soft-serve crepe? Both ridiculously incredible crepes. Also, both vegan/vegetarian breakfast crepes. 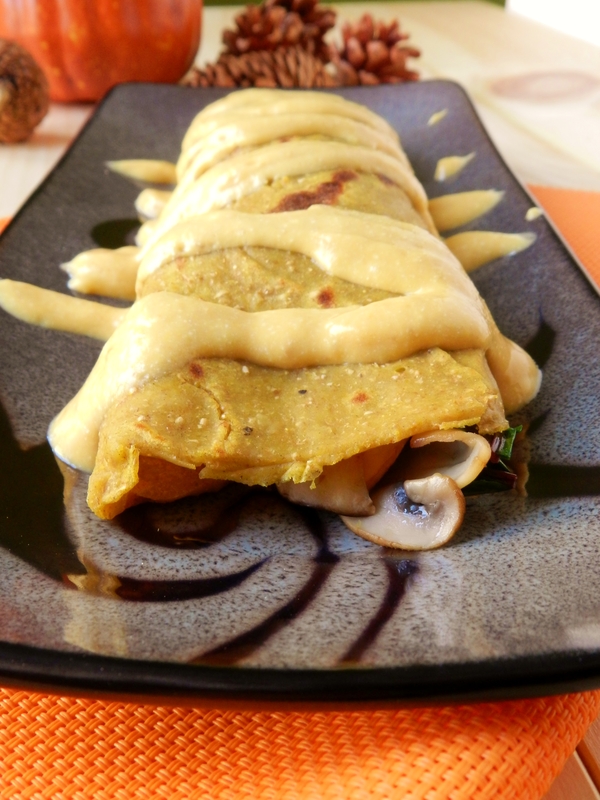 Today, we bring to you a different type of crepe, a savoury, slightly more traditional one. Well, sort of. We basically say that because it uses egg whites. 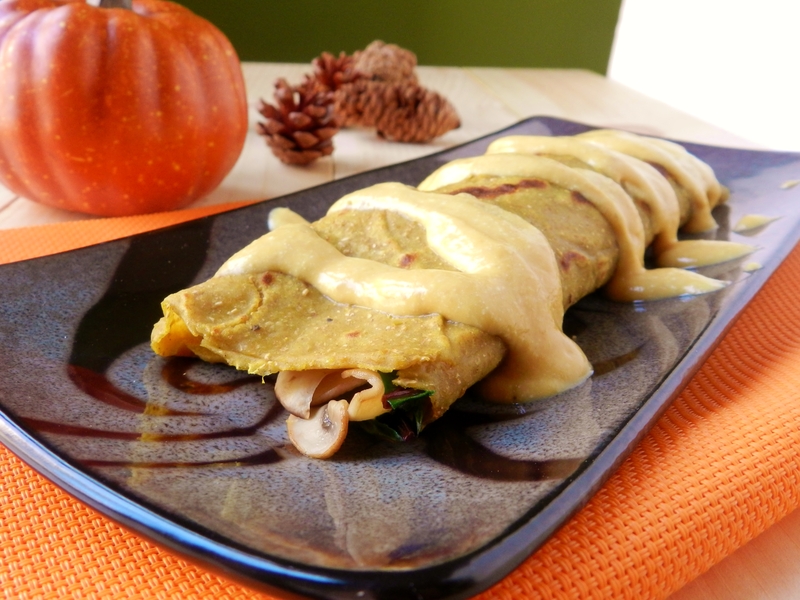 Pumpkin-sage crepes filled with sauteed mushrooms, onions and beet greens, with a pumpkin-cottage cheese sauce. A little weird to some, maybe, but don’t be afraid! These crepes were a-maz-ing! We won’t lie to you – this was one of those times where we thought we were going to have to scrap it and do something else. When we first poured the batter out onto the pan, things looked bleak. It wasn’t spreading out well and was cooking faster than we could spread it, too thick in some places and too thin in others. In a panic, we took the pan off the heat and spread the batter evenly around the pan with a spatula, and would you believe it? It worked! They cooked wonderfully, and were really easy to flip! So these crepes are healthy, easy to make, and crazy good – meaning you should do yourself a favour and try them out! Combine wet and dry ingredients in separate bowls, then mix together until just combined. Heat a large, greased, flat-bottom non-stick pan over med-high heat. Pour half the batter onto the pan and spread to the edges. Once browned on the bottom, (only a couple minutes or so!) flip over and continue cooking on the other side until lightly browned. Remove crepe and repeat with remaining batter. Slice desired amount of mushrooms (we used approximately 1 cup) and greens (we also used about a cup). 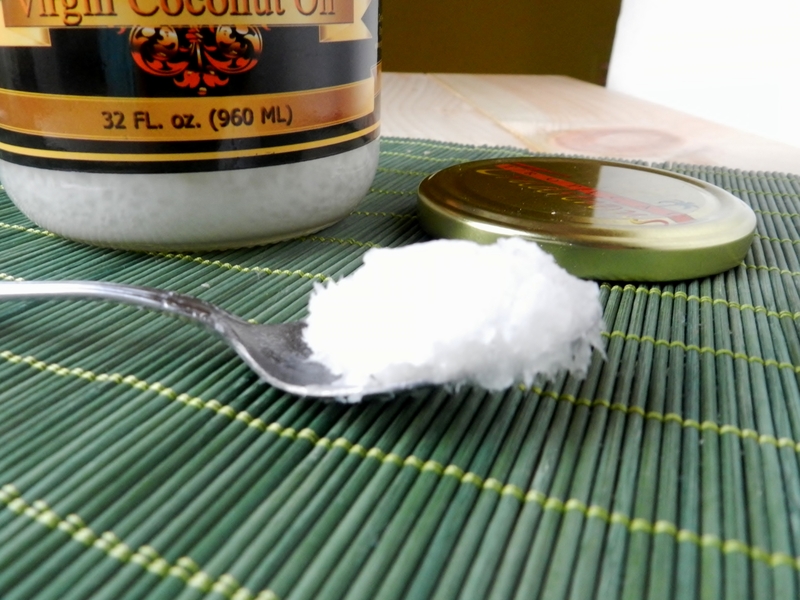 Heat a small amount of coconut oil on a medium-sized frying pan. Add mushrooms and greens and cook until the mushrooms are softened and greens are wilted slightly. 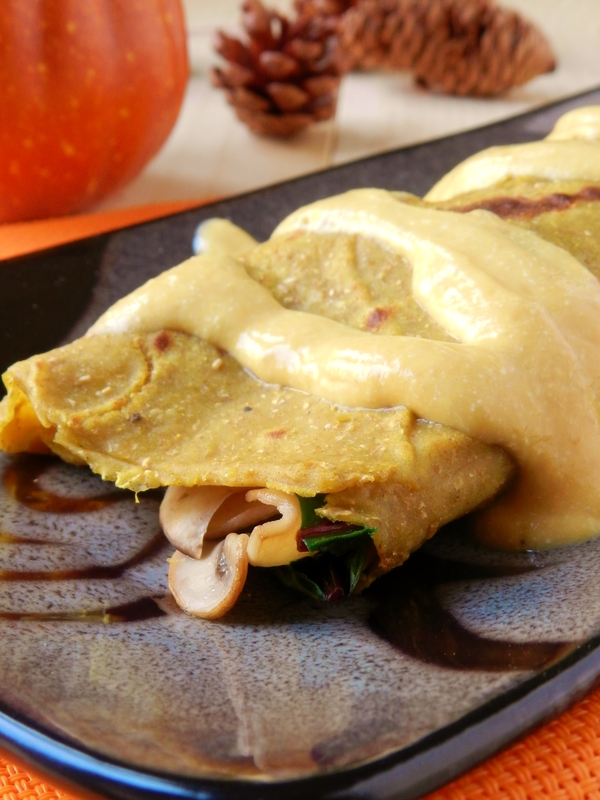 What do you prefer – sweet crepes or savoury? 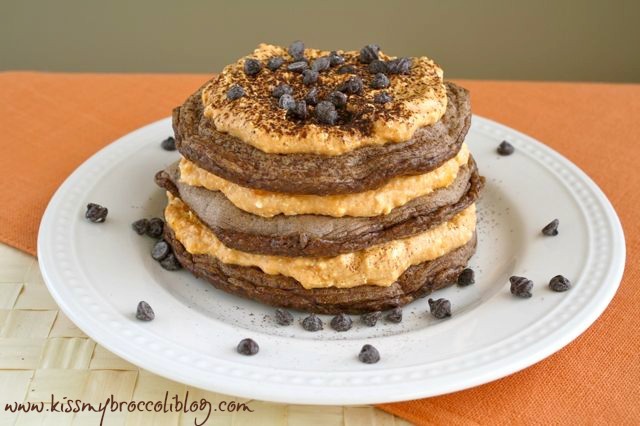 Posted in Uncategorized and tagged beet greens, cottage cheese, crepe, dinner, easy, egg whites, healthy, lunch, mushrooms, nutritional yeast, pumpkin, quick, sage, vegetarian, whole wheat. Bookmark the permalink.